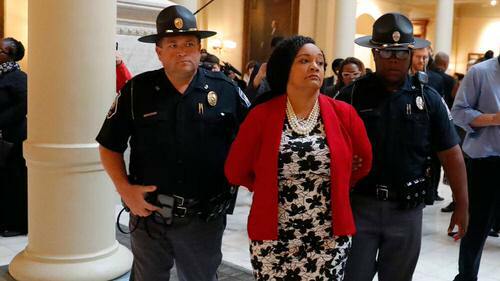 Georgia state Sen. Nikema Williams (D-Atlanta) was arrested along with more than a dozen other protesters at the Georgia State Capitol on Tuesday afternoon at a demonstration asking the state to “count every vote” from last week’s gubernatorial election. Protesters shouted “Let her go!” as Williams was handcuffed while the General Assembly was in session. Williams, a civil rights advocate who organized domestic workers for Democratic gubernatorial candidate Stacey Abrams, was charged with misdemeanor obstruction of justice and spent about six hours at Fulton County Jail in Atlanta. “What is wrong with white women?” Moira Donegan asked at the Guardian after last week’s midterm elections. Progressives sometimes expect white women, as a group, to support the interests of people of color of all genders — after all, women know what discrimination feels like. But that common cause has been elusive. 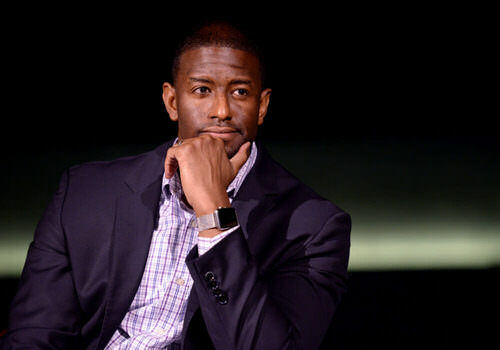 The winner of Florida’s gubernatorial race is still up in the air, but even if he loses, Democratic candidate Andrew Gillum can take pride in at least one thing: he bested Donald Trump on Twitter. And he only needed three words to do it. On Monday, the president argued that the Florida election should be called in favor of Republicans Ron DeSantis and Rick Scott even though doing so would buck the state’s recount procedures. However, he came out on top with his response to Trump’s conspiratorial tweet. Are you ever confused about where you should vote? Do you worry whether your vote counts? Reporter Kamaya Truitt looks at the strange case of North Carolina A&T State University, which state legislators divided into two congressional districts. Student activists say it’s a case of gerrymandering to split the Black vote. They’re mobilizing to make sure their voices are heard. Politicians from both sides of the aisle have all but conceded that Republicans have virtually no chance of holding onto their majority. That includes religious right leaders, who are now laying out their strategy to stop Democrats from passing any legislation that would help LGBTQ people. In particular, they have declared war on the Equality Act, a measure that would add gender identity and sexual orientation to existing civil rights protections. The Equality Act Would Outlaw LGBT Discrimination. Will It Ever Be Passed? Symone D. Sanders On "Why We Must Vote!" 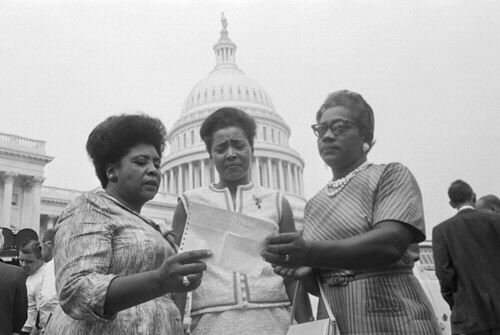 On August 22, 1964, Fannie Lou Hamer went before the Democratic National Committee to insist that the Mississippi Freedom Party, an organization she started to help African-Americans register to vote, be seated to integrate the all-White Mississippi delegation to the Democratic National Convention. Then President Lyndon B. Johnson tried to silence Hamer. His aides and allies pressured her not to speak, and in a final effort to keep her from being heard, President Johnson called an impromptu press conference so her words would not be televised. Fortunately, his plan to distract reporters backfired: Hamer’s 13-minute testimony detailing the inequities visited upon Black people who just wanted to vote in the land they called home was aired later that evening on prime time. Hamer was a political force who would not be ignored. A local leader who thought globally, she knew she could not afford to sit back and let the injustices of her time go unchallenged and unchecked. President Donald Trump tweeted a new ad that is almost too racist to believe on Wednesday. The ad from Trump’s campaign, which accuses Democrats of allowing Mexicans and Central Americans to murder Americans, is the latest escalation in Republicans’ very obvious attempts to stoke fear about brown people and distract from unpopular conservative policies. The president’s party is widely expected to lose control of one chamber of Congress in Tuesday’s midterm elections. While smearing immigrants is a time-honored tradition for many on the right, the president’s efforts to make a major campaign issue out of a migrant caravan traveling north from Central America (and currently 1,000 miles away from the U.S. border) has been echoed by prominent Republicans, Fox News, and numerous other propagandists in conservative media. But don’t just take our word for it. Let’s dig into the data to show why Republicans’ recent cherry-picking has no basis in reality. 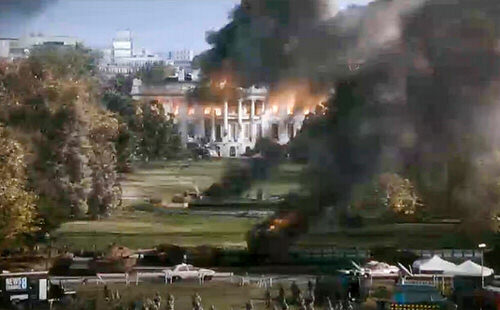 “I am sick and tired of this administration. I am sick and tired of what’s going on. I’m sick and tired of being sick and tired, and I hope you are too,” Biden said, appropriating a famous quote by the black civil rights movement activist Fannie Lou Hamer. In an effort to radically change the dynamic, conservative television pundit Candace Owens is urging black Americans to join her in a new political campaign to break bonds with a half-century of fealty to Democrats. Her movement is called “Blexit.” You see what she did there: black and exit. Relying on white suburban women using the midterms as a referendum on Republican excess is a loser’s bet. This seems obvious to anyone who paid attention to the 2016 election (or the last six decades of electoral history), but it’s also what comes across in this Politico piece delving into a contentious house race in North Carolina where a young, moderate Democrat by the name of Dan McCready is up against a bible-thumping Trumpite, Republican Mark Harris. Reporter Michael Kruse went to the state’s ninth district—which stretches east to west from Charlotte to Fayetteville—in search of the much discussed and supposedly politically consequential suburban white woman, a voting bloc that pundits, talking heads, and strategists have argued can make or break the outcome of certain elections this time around.